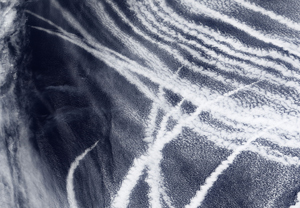 This page from NASA's Earth Observatory shows images of visible tracks made in the Earth's atmosphere from clouds forming around ship exhaust particles. One of these images shows the relative sizes of the particles, and the text relates the relative sizes to the relative brightness of the clouds that are formed. (Goddard Space Flight Center, Greenbelt, 2009), WWW Document, (http://earthobservatory.nasa.gov/IOTD/view.php?id=37455). Ship Tracks South of Alaska, (Goddard Space Flight Center, Greenbelt, 2009), <http://earthobservatory.nasa.gov/IOTD/view.php?id=37455>. Goddard Space Flight Center. Ship Tracks South of Alaska. Greenbelt: Goddard Space Flight Center, March 31, 2009. http://earthobservatory.nasa.gov/IOTD/view.php?id=37455 (accessed 23 April 2019). Ship Tracks South of Alaska. Greenbelt: Goddard Space Flight Center, 2009. 31 Mar. 2009. 23 Apr. 2019 <http://earthobservatory.nasa.gov/IOTD/view.php?id=37455>.